The banded civet (Hemigalus derbyanus) is a cat-like carnivore, with sharp, retractable claws. It typically has a buff-coloured coat with broad, dark bands along its back and the base of its tail. A narrow stripe passes from its nose to the nape of its neck, with two broader bands either side which surround the eyes and extend past the ears. The hairs of the coat point backwards, except on the back of the neck where they point forwards. 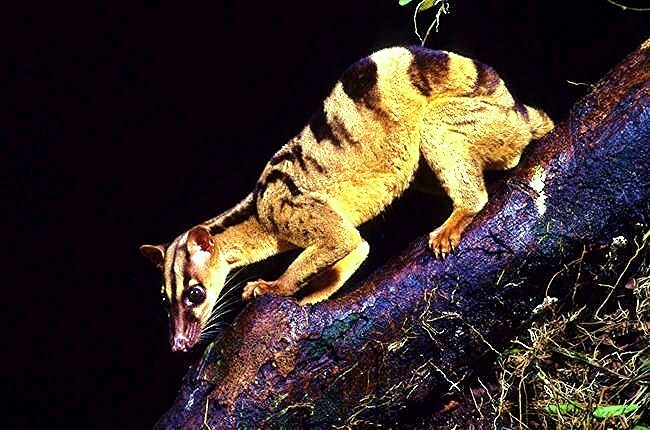 Coat colour varies between individuals, and the banded civet may be beige, grey or yellow, usually with paler underparts, and bands of either dark brown or chestnut. It was once thought that this colour variation could be used to distinguish between subspecies; however, coat colour does not vary consistently between geographical locations. Three subspecies have been described: Hemigalus derbyanus minor, Hemigalus derbyanus sipora and Hemigalus derbyanus derbyanus, however only Hemigalus derbyanus minor has been formally acknowledged.